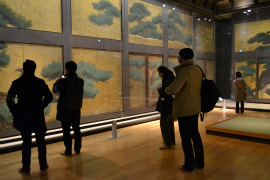 Upon arrival in Kyoto, the tour first visited Ninomaru Palace in Nijo Castle, a UNESCO World Heritage Site. 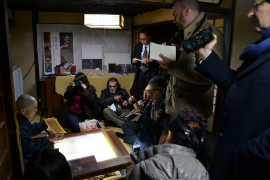 Curator Ms. Shiho Nakano acted as a guide for the journalists, explaining the purpose of each room in the palace and the motifs of the wall paintings made to match each room. 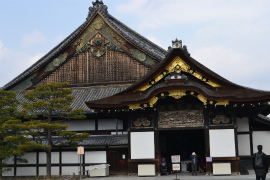 By actually walking through the palace, journalists could see the necessity of preserving cultural artifacts found in Japanese architecture, which is easily affected by daylight, temperature and moisture. Some journalists examined the paintings in detail, while others asked about the wall paintings and Kano School painters. 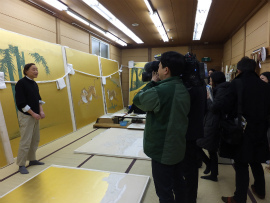 The tour then moved to where the paintings are being reproduced, and heard from Japanese-style painter Mr. Toshihide Tanii, who reproduces the wall paintings of Ninomaru Palace for the reproduction project. 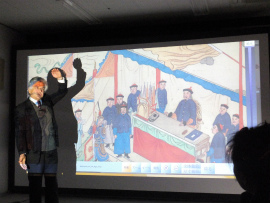 He spoke about how the original paintings became damaged and discolored, what efforts are involved in making colors look like a hundred years have passed in order to match the new reproductions to the atmosphere of the old building, and how the techniques of the Kano School were being faithfully reproduced. 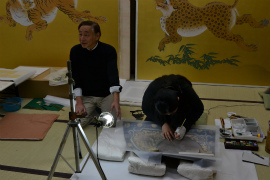 He demonstrated how an original painting is copied onto tracing paper and how to apply gold leaf. Journalists enthusiastically filmed his work, and interviewed several artists. In response to a question about whether he felt a connection to the techniques and spirits of artists of the past while working on reproductions, Mr. Tanii replied that “Working on these reproductions has made me understand just how wonderful the techniques of these artists in the past were.” The journalists then visited the Exhibition and Museum Collection to view and film the original wall paintings. 2. Yokoyama Bamboo Products Co., Ltd. 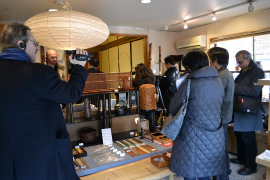 The tour visited Yokoyama Bamboo Products, a store with 96 years of history, to cover traditional industries in Kyoto. 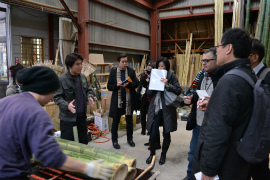 Guided by fourth-generation owner Mr. Yuki Yokoyama, journalists observed bamboo being worked on. 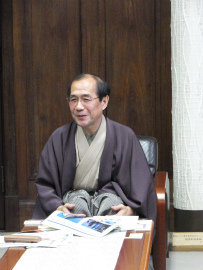 A journalist asked why Kyoto became the bamboo capital, and Mr. Yokoyama explained “The heads of various arts, such as tea ceremony, have gathered in Kyoto since long ago, and there was a culture of using bamboo for gardens, architecture and interiors.” Some of the journalists were shocked upon hearing that bamboo material made with old bamboo exists that costs two million yen per poll. Next, after moving to the Yokoyama Bamboo Products shop where bamboo sundries are sold, journalists interviewed Ms. Megumi Tanaka. 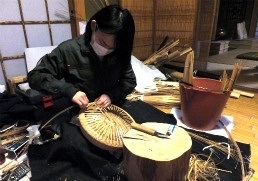 In her 20s, she is the youngest Yokoyama Bamboo Products employee. Ms. Tanaka manages the store and makes bamboo sundries by hand in the shop. After the interview, one of the journalists bought bamboo chopsticks as a souvenir. 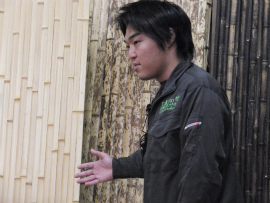 Finally, Mr. Yokoyama explained the world’s first fireproof bamboo, developed by Yokoyama Bamboo Products. It took five years to develop the product so that it could be used in commercial buildings as well, soaking the bamboo in special chemicals yet still keeping its original texture. One year since release, it now accounts for 20% of total sales. 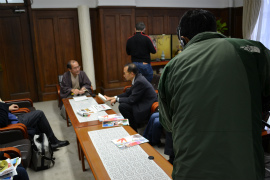 Journalists asked questions about topics such as what benefits bamboo has compared to plastic, and about targeting overseas markets. 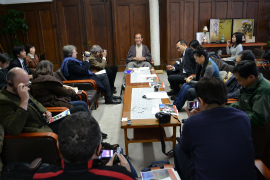 Journalists asked questions about the decreasing amount of work on kimonos, and training successors. Journalists were impressed with how attractive the iPad cases are, designed so that the pattern is backlit by the LCD screen. 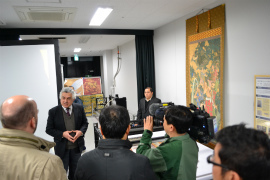 On the second day of the press tour, the journalists visited the Katsura Campus of Kyoto University to meet with Professor Ari Ide, who is working on digital preservation of cultural properties. 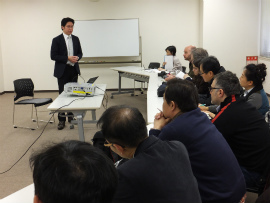 Professor Ide mentioned the benefits of being based out of Kyoto, which has cultural properties, universities and advanced technology, and explained examples of digital archiving projects in Japan and abroad. Journalists asked about who would hold the copyright for digital images of artwork, and about projects underway in their own countries. 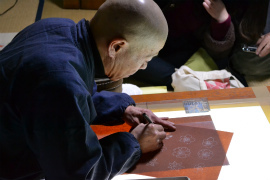 Next, demonstrations were given of making a one centimeter portrait life-sized, and of scanning cultural property. 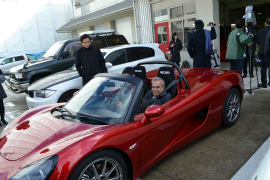 After the interview, journalists had the opportunity to actually ride in the electric sports car. Journalists were impressed at its rapid acceleration and how quiet its engine was for a sports car, due to it being an electric vehicle.